Mentalist David Meade provides entertainment at ASM’s 20th birthday celebration! 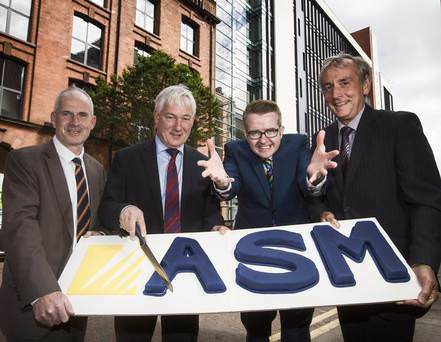 The accountancy firm ASM has celebrated its 20th anniversary, with mentalist David Meade providing entertainment to the 160-strong team at the birthday celebration! The firm was established in 1995 and has become one of the province’s biggest accountancy and management consultancy firms. It employs 160 people and has offices in Belfast, Dublin, Dundalk, Dungannon, Magherafelt and Newry. Founders Norman Adams, Stephen Sproule and Michael McAllister are still in the firm. Mr Sproule said: “From day one, Norman and Michael and I had a vision to be one of the leading accountancy firms in the country, with the ability to work in both jurisdictions. David Meade: the future of leader development? Simply sign up to our Newsletter so you’re guaranteed to never miss a thing!